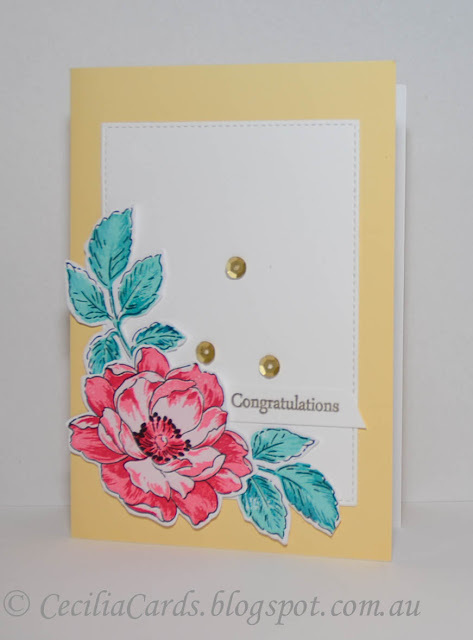 I have another card to share using Hero Arts Big Floral Stencil. 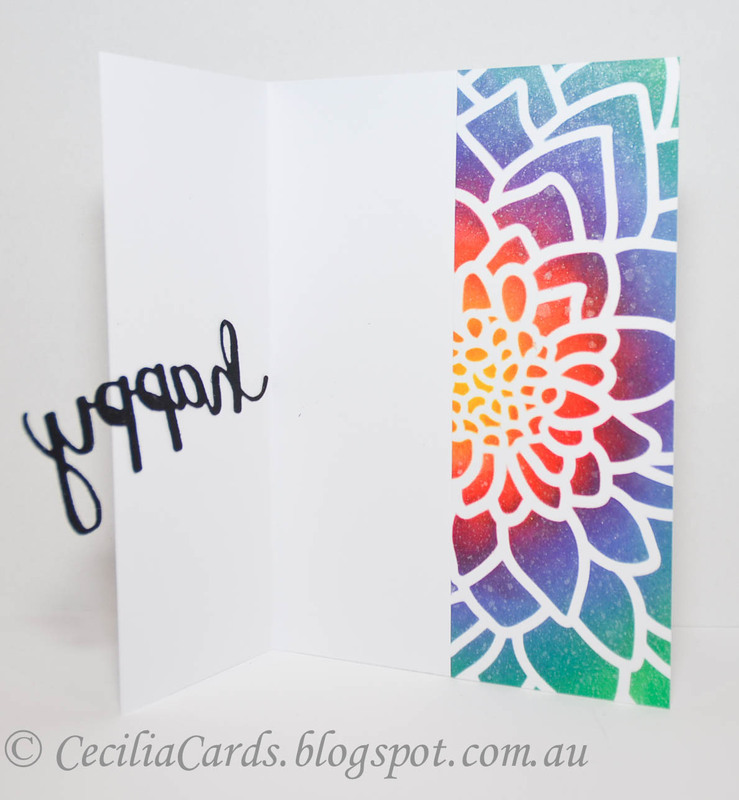 I sponged with rainbow colours with distress inks and spritzed with some water before removing the stencil. A stamped bold sentiment with some sequins and enamel dots to finish off the card. Simple and quick! 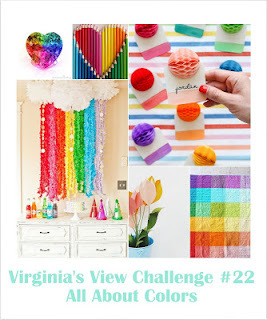 I'm adding this to Virginia View's All About Colours challenge and Simon Says Stamp Wednesday - Anything Goes Challenge. Thanks for dropping by! 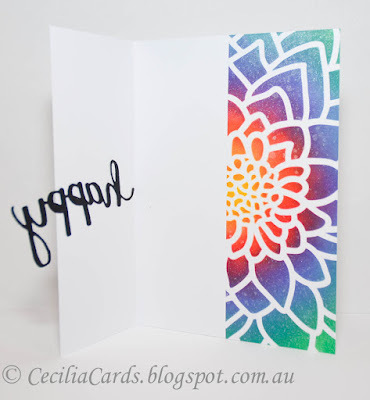 I would like to thank Michelle Lupton for giving this Hero Arts Large Flower stencil! I'm still a bit of a novice to the art of stencilling! 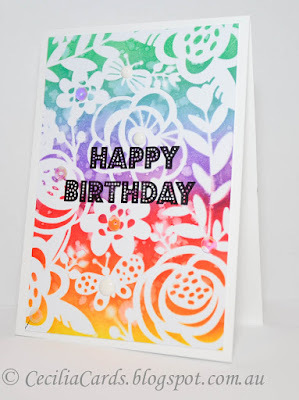 I decided to add rainbow colours to this stencil and I really did not wanted the colours to be so strong (reminds me of batik). As I was blending to get a smooth coverage, the colours intensified. I added a spray of Perfect Pearls to give it the glittery translucent effect. I then left this to dry for a couple of days before I decided what to do with it. I decided to glue a panel of the background onto the inside of a card and the same panel was cut from the front of the card. I then cut out 3 'Happy' dies - one white and two black. 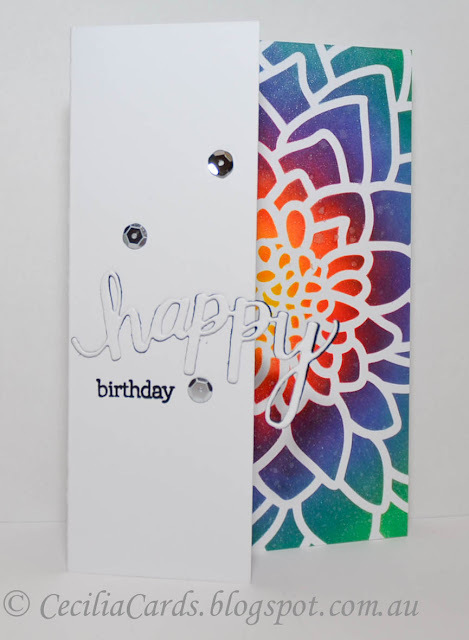 The diecuts were then adhered together onto the front panel of the card and the sentiment and some sequins added. I'm adding this card to Virginia View Challenge - All About Colours. This post is for A Blog Named Hero's Facebook Fan Page. When I received a new stampset, I usually stamp a few samples with different colours and cut them out. It is handy when you are in a hurry as it takes no time to assemble a card. 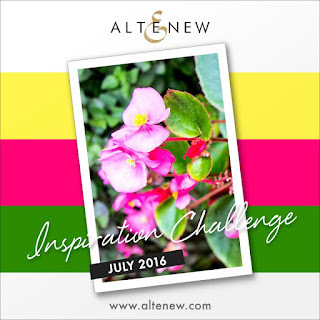 When I saw Altenew's July inspiration photo, I just pulled out a few of these stamped images from Beautiful Day and started putting the card together. I'm also adding this to Simon Says Stamp Wednesday challenge - Anything Goes. Thanks for dropping by! I used: Altenew Beautiful Day and Peony Scrolls, MFT DieNamics stitched rectangle die, Hero Arts card stock, Altenew (flowers) and Hero Arts (leaves) inks.